I stirred my coffee clockwise, then placed the spoon back on the saucer and took a sip. My friend Scott sat across from me, waiting expectantly for my answer. It was already 2pm. I didn’t know if we had time to drive the hour it took to get to Turpins Falls, and back again before it was “supposed to rain”. I looked out of the cafe window at the slightly overcast, but albeit mostly sunny afternoon. “Alright, screw it, let’s go,” I replied. Then turn right onto the State Route 43/Citylink ramp to Bendigo/Airport/Hume Highway (a partial toll road – more information on tolls in Melbourne can be found here). As mentioned, the E Metcalfe-Langley Road begins sealed and then fades into a dirt track, though it is in reasonable condition. After about 300 meters, the turn off to Turpins Falls carpark will be on the right. Keep an eye out for it, because initially we drove straight past it. The ‘carpark’ is a wide, flat clearing. 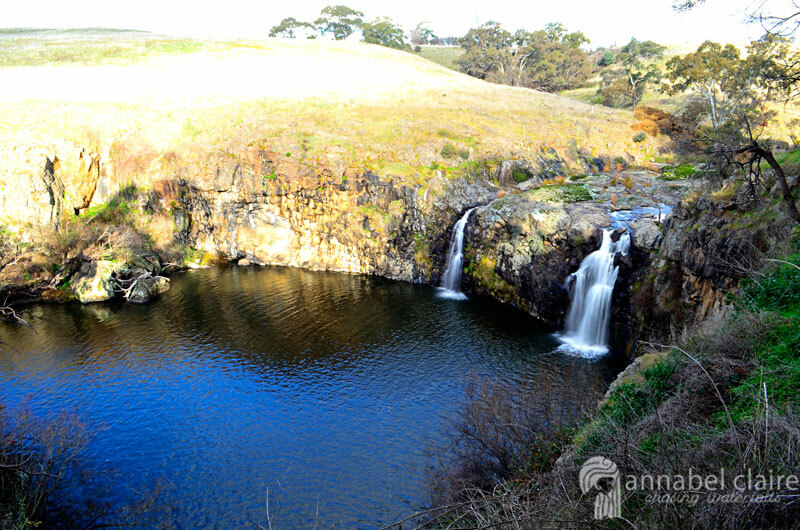 There are no facilities at Turpins Falls whatsoever – the nearest town is Kyneton about 15 minutes away. Turpin Falls are literally straight ahead from the carpark. It’s here I should warn you that there have been deaths in this area, so mind your step and don’t take any unnecessary risks. The path to access them begins off to the right, and meanders down the hill. But it’s still relatively easy. From here you can see the very top of the falls and the river that fuels them. The path zig-zags drastically in order to get further downhill. About halfway down was the perfect spot to stand for a photo, so in typical Annabel style, I set up my tripod on the rocky, uneven path in the above photo. It wasn’t the easiest thing getting the right angle, and the sunny day we were experiencing wasn’t cooperating with photos. But nevertheless, I forced Scott to take photos of me standing and gazing at the falls. Sorry bro. Much to Scott’s delight, we finished with the photos of me and headed further down the track, where I snapped a few more shots with my 300mm lens. The path continues on, becoming narrower and allows access to the very base of the falls. Be sure to stop along the way and admire the view of the open gorge, because it’s quite spectacular. The sunlight was posing a slight issue with long exposure, so I took a few more zoomed-in pics to try and showcase the beauty of the falls. After a rocky, slightly difficult last descent, we reached the bottom (view of the steps in below photo is taken from the bottom of the path). There are many angles along the riverbank to view the falls, so I recommend taking your time and soaking it all in. The large water-hole puts quite a distance between the bank and the falls. I would imagine it would be a perfect spot to visit in summer ft. #basicbitch floatation devices in the shapes of donuts and watermelons and all that jazz, which I’d so bring along (yes, guilty as charged). This was probably my favourite angle to capture photos, because it eliminated the sunlight. For the most part. After a fair while of Scott and I capturing shots on our camera’s (both Nikons, FYI), I wanted to get more shots of me standing in front of the falls but was too embarrassed to bring it up. So I just continued finding new angles to photograph the falls – mostly in an effort to find the perfect spot for me to stand. Just as we were about to leave, I finally broke my silence and started to half-winge half-joke that I wanted photos of me in front of the falls. Scott rolled his eyes, laughing. I took it as approval. So I set up my tripod, but with Scott chuckling at me, it resulted in some very awkward photos of me feeling like a loser. Classic. It was easier just to turn away so that I couldn’t see his smug face haha. Eventually, the sun begun to descend in the sky, and it was time to head back uphill. I think this would be a really incredible spot to visit on a moonless night and capture some long exposure night shots. I vowed to come back and give that a go sometime, so keep an eye out for updates! In the mean-time, I just had to make do with the gorgeous sunset on the drive home. Looking for other day trips to do around Melbourne, Victoria? Try Masons Falls or Wombelano Falls in Kinglake, or Olinda Falls in the Dandenong Ranges. Best Time July-September for water flow, November-March for swimming (water is extremely cold, not recommended).